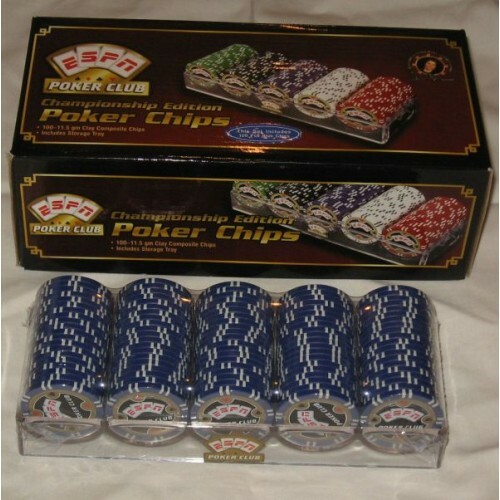 The Box of 100 Blue ESPN Poker Club Championship Edition 11.5 Gram Chips with Storage Tray includes 100 clay composite chips plus clear plastic storage tray. This is a bulk box, which has only blue chips, and NOT the assortment that is pictured on the packaging. Chips are 40mm in diameter by 3mm thick. Do you have any questions about 100 Blue ESPN Poker Club Championship Edition 11.5 Gram Chips with Storage Tray?